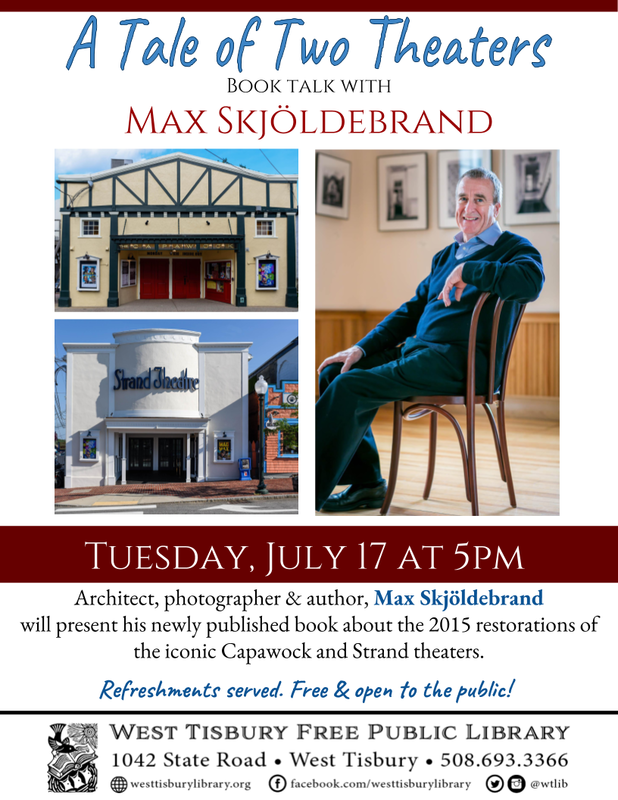 On Tuesday, July 17 at 5pm, join us for a book talk with Max Skjöldebrand on his newly published book, A Tale of Two Theaters. Learn about the 2015 restorations of the iconic Capawock and Strand theaters. Books will be available for purchase and signing. This event is free and open to the public, and refreshments will be served. Max Skjöldebrand is a British architect and a photographer who first started coming to Martha’s Vineyard in 2000 as a seasonal resident and has lived on Martha’s Vineyard year-round since 2010. Max has exhibited his photographs at the Featherstone Center for the Arts and has had solo photography shows at the West Tisbury Library, the MV Film Center and at the Vineyard Playhouse. In April-June 2015, Max photographed the restoration works of The Capawock and Strand Theatre. A selection of these photographs is now on display at the Winnetu Oceanside Resort in Edgartown.